Last week I was and still continue to have a real craving for vanilla. Hunting for sweet, dark, rich scents in everything I was looking for, something really quirky and noticeable, nothing at all like traditional Men’s fragrances. Something really weird. I decided to tweet this being an avid twitterer, and my non-sensical rambling was actually kindly responded to by Nick Gilbert who writes a great fragrance blog and is from a company called Les Senteurs, a fabulous site that has sourced some of the world’s truly finest fragrances. He sent me through the post 4 sample cards with vials of what he believed would satisfy my craving, and oh was he right. 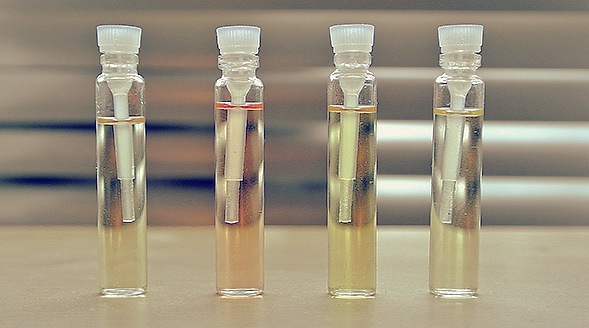 I’ve reviewed the four fragrances individually and I’m sure you’ll be able to tell which was my favourite. If you click each of the names it’ll link you to it’s page and they also offer a fragrance sample service as well before you buy a full bottle. Rum, Vanilla, Tonka, Orange are the notes that I picked up most strongly from this incredibly deep and intoxicating unisex scent. It has this old musk to it that just melts into the skin with this black, chocolatey edge. I wouldn’t say this fragrance was particularly sweet, more bitter but still very rich. It has outstanding lasting ability and really you need the tiniest amount. I can’t remember the last time I wore a fragrance that so many people commented upon. This is my favourite out of the quad. This is fun. Top notes of rounded, smooth, mouth watering citruses are backed up by woods and musk and as the fragrance develops, you can really pick out the sultry suede. This is a great work fragrance, suited and booted and carrying your Kindle, this modern fragrance is the perfect partner for your working day to both lift and energise. To me this smells like fresh opened paper, an intelligent, wise and mature fragrance. Tahitian Vanilla comes through really well backed up by Iris, Hay and Amber. It’s warm but not overbearing. Once on the fragrance is crisp and sharp, but settles into the background quite nicely whilst still being quite prominent, with the hay and vanilla exuding a sort of heat. An incredibly crisp and fresh fragrance with rosewood and sandalwood that smells like beautiful indian incense backed up with vanilla and myrtle. It reminds me of being sat outside in the garden on a late summer evening with good food and good drink with hot humid air – not quite sure if I mean in Britain or not, doubtful from that description! Like the other PG fragrance it reminds me of books and I’m not sure why but there is just something so ‘grown up’ about it and I feel not quite sure that in my twenties I’m mature enough to be able to pull it off. A definite for Father’s day though! This article first appeared on MANFACE written by Thom Watson. It was published on Tuesday 8th May 2012 and was last updated on Monday 3rd April 2017 at 4:21pm. It's categorised under Fragrance, Mona di Orio Les Nombres d'Or, Parfumerie Generale where you'll find more related content.